An easement in its simplest term is the right to use the real property of another for a specific purpose. An easement can be expressly or impliedly acquired. An easement may be given in a deed, obtained by necessity of use, or acquired through adverse possession (also called a prescriptive easement). In Florida, an easement is usually expressly granted by the title-holding landowner by means of a written agreement, deed, or deed reservation. Easements Appurtenant – An easement appurtenant benefits an adjoining or adjacent piece of land and continues regardless of the ownership of the land. Easement in Gross – An easement in gross (personal easement) benefits an individual or a business entity and is not related to a specific adjacent parcel, such as utility easements. Easement by Necessity – An easement by necessity is created through a court of law to allow property owners to enter and exit their landlocked property. Easements by Implication – An easement by implication is when property has been traditionally or historically used in a certain way. Prescriptive Easement – A prescriptive easement is an easement created by the open, notorious, uninterrupted, hostile, and adverse use of another’s land for 20 years or for a period set by statute. 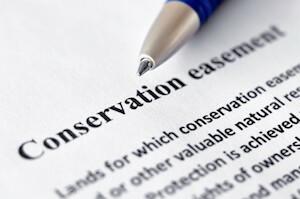 Conservation Easement – A conservative easement is an easement created by parties expressly to limit the further development of a property. These easements are acquired by the government or a charitable organization to preserve the historical or cultural use of the land. Interpreting unclear easement descriptions in deeds, deed reservations, etc. KALIS, KLEIMAN & WOLFE’s attorneys have worked with Miami and Fort Lauderdale real estate developers, builders, businesses and homeowners to facilitate development projects, protect their land, and resolve easement disputes for more than 50 years. It is important for homeowners, businesses and landowners to understand whether a piece of property you own, or may be interested in acquiring, is affected by easements, how to interpret the writing creating the easements, and how the right to use the easements may be exercised. When you are facing a dispute over an easement or boundary issue on or near your property, contact the experienced Real Estate attorneys at KALIS, KLEIMAN & WOLFE, the South Florida-based real estate law firm today at (954) 791-0477.